The ASIA School of Business in collaboration with MIT Sloan School of Management (ASB) today reached another milestone since its inception a year ago with the commencement of the construction of its own campus in Bukit Perdana, Kuala Lumpur. 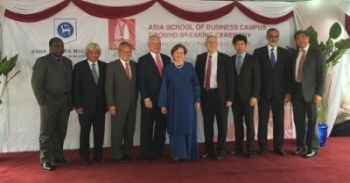 The ground-breaking ceremony was officiated by the Co-Chairs of the ASB Board of Governors, Professor Richard Schmalensee and Tan Sri Dr. Zeti Akhtar Aziz. It was witnessed by members of its Governing Board, business leaders, and dignitaries from the corporate partners, the diplomatic corps, and the public sector. Reiterating MIT's commitment to the project, Professor Richard Schmalensee, a former Dean of MIT Sloan said, "Global engagement is part of MIT Sloan's DNA. Over the course of eight decades, the School has established deep connections with universities and other organizations in more than a dozen countries, and we are so excited to have begun this collaboration in Malaysia. We expect to learn at least as much as we teach." Recognizing the need for quality talent by corporates and businesses in the Asian region, Bank Negara Malaysia Governor, Tan Sri Dr. Zeti Akhtar Aziz said, "At a time of growing importance and influence of this region, innovative and entrepreneurial skills are critically needed. The offerings by the School are ambitious. Not only the theoretical foundations and its practical application but also to provide a greater understanding and appreciation of the dynamics of the environment in the emerging world, in particular Asia." "The establishment of ASB is an important initiative to meet the increasing demand for such talent with such capabilities. This represents part of the Bank's commitment in the investment in education," said Governor Zeti. The buildings on the campus will be equipped with technology-rich facilities and classrooms to help deliver the action learning and practice-oriented approach to business management education that the ASB MBA will be known for. The campus will also contain residential buildings for students to encourage dedicated and productive work. The ASB 18-month MBA programme will offer a world-class business education based on the rigour of MIT Sloan's curriculum complemented with the Asian perspective. The educational process of ASB will bring the values from MIT Sloan which emphasizes action learning. Through action learning projects, students will apply the business management theories in a broad range of real-life organisational and institutional settings. The programme will also foster entrepreneurship and innovation DNA, which is also the hallmark of MIT Sloan.